Parts Used: No parts are used. The Saltmarsh Bird's Beak is an annual and lives for one year and then dies. Its leaves are alternate, narrow and up to 1 inch long. They are pointed at the end, and bluish green and hairy. The Saltmarsh Bird's Beak has white flowers that grow on 4 to 12 inch high stems. It belongs to the Figwort Family and is related to the snapdragon. This is a very interesting plant because it is semi-parasitic. It uses pickleweed and salt grass to extend its growing season. 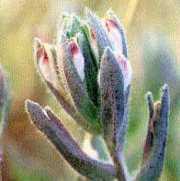 The Saltmarsh Bird's Beak only grows in the saltmarshes, just above the high tide line of the coastal chaparral of the San Diego County area, California. It is considered an endangered plant in California and throughout the USA.